in our garden. Lunch served, the conversation drifts on. evanescent junction, silvery in the moon's rays. the distinctive moods and aspects of Edinburgh in winter. 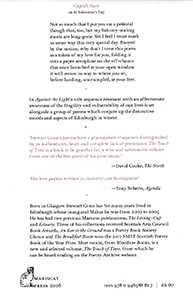 [The opening winter sequence] meditates on the particular coldness of Edinburgh’s heart. Conn’s writing displays a wonderful sense of bathos that incorporates the grandeur of the scenery and the frivolousness of tourism... modern Edinburgh awash with holidaymakers. 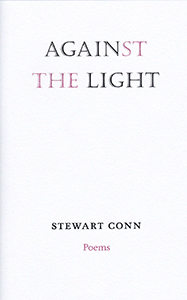 In Against the Light – the superlative poem of the collection – the narrator watches his love throw away her painkillers... [while] poems like Charmed Lives, about the comic fall from grace of two collared doves, contain some wicked humour.